Already a quick glance at the thumbnails below shows that vignetting on a small APS-C sensor is not a problem at all. These impressions are confirmed by our measurements. At the shortest focal length the vignetting would be difficult to notice even at the maximum relative aperture, where it is just 12% (-0.37 EV). It disappears completely on stopping down the aperture to f/5.6, where it reaches just 5%. At 135 mm the brightness loss in the frame corners is just slightly higher. 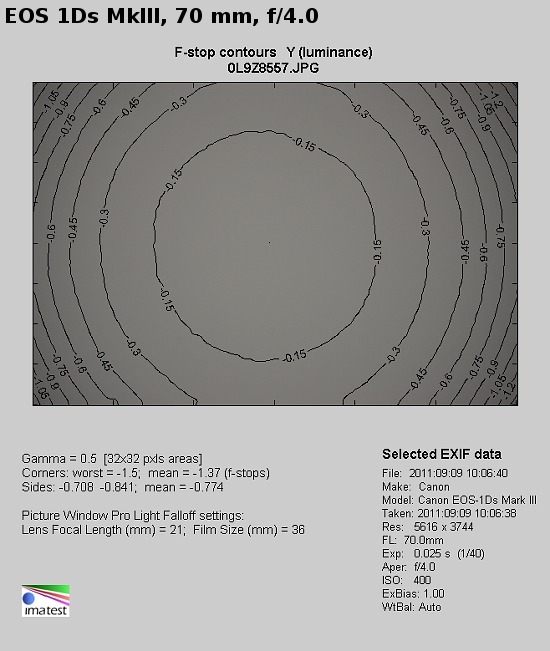 At the maximum relative aperture (f/4.5) it amounts to 14% (-0.44 EV) and it decreases to 8% at f/5.6. The situation improves again at 200 mm – in its case at f/5.0 the vignetting gets to just 11% (-0.34 EV) and it decreases to an imperceptible level of 8% at f/5.6. A slight increase of vignetting can be observed at 300 mm. 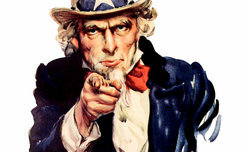 At the maximum relative aperture it is 14% (-0.43 EV) and it decreases to 5% at f/8.0. Let’s check how the situation looks like on full frame. The appropriate thumbnails of photos, taken with the Canon EOS 1Ds MkIII, are presented below. Without even looking at the precise measurement results you can notice there are more problems here and the vignetting level can be hardly called low. For the combination of the minimum focal length and the maximum relative aperture it amounts to 38% (-1.37 EV) and on stopping down to f/5.6 it decreases to the value of 16%. 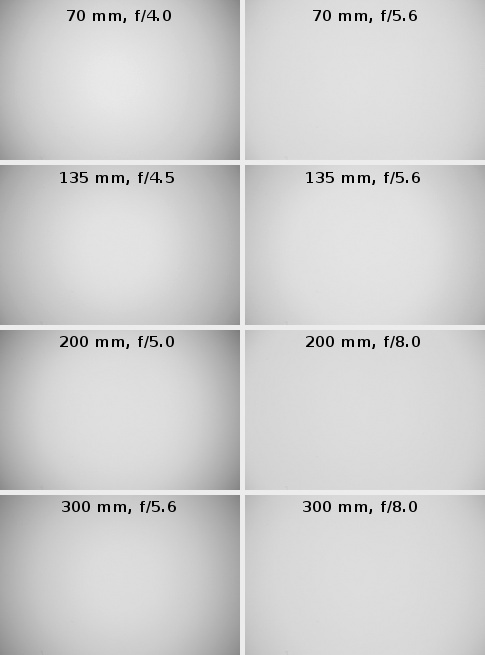 The vignetting becomes imperceptible only by f/8.0, where it falls to 7%. 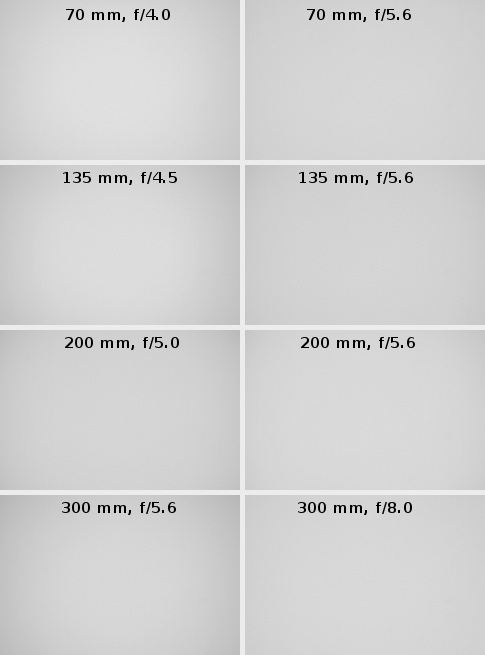 In the case of 135 mm focal length the vignetting at the maximum relative aperture is similar to that of the shortest focal length, amounting to 36% (-1.29 EV). What’s interesting, here that aberration decreases quite slowly on stopping down. At f/5.6, f/8.0 and f/11 it is respectively: 24%, 13% and 7%. The most problems with vignetting you will see at 200 mm where, at the maximum relative aperture, it reaches the value of 40% (1.48 EV). On applying f/5.6 aperture the level of that aberration decreases to 33% and by f/8.0 it reaches 14%. The aberration becomes imperceptible only by f/11 where it is just 6%. At the maximum focal length and f/5.6 aperture the light fall-off in the frame corners is 37% (-1.34 EV). On stopping down the lens to the value of f/8.0 that aberration reaches the level of 14% and after using f/11 the problem practically disappears (6%). As you see big dimensions of the Canon 70-300L didn’t make vignetting problems disappear. It is even more puzzling because the Tamron 70-300 mm VC, being smaller than the Canon, tested here, managed to fare in this category noticeably better.